A simple gift that makes a powerful statement! 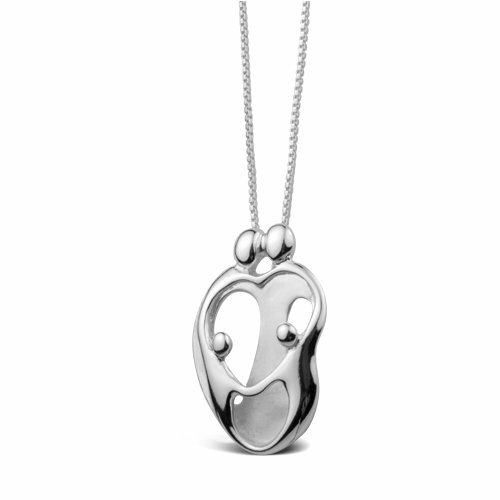 The original Loving Family® pendant is the gift that moms of all ages love to receive year after year. Measuring 1" L x 1/2" W, the pendant depicts loving parents and two children whose touching embrace forms a heart. Striking pendant comes ready to wear on an 18" L sterling silver box chain with spring ring clasp. This delicate, artistic symbol of family love is sure to warm the heart of any mother - no matter the age of her children. Proudly made in New Mexico, USA with fair labor. We do our part for the environment by crafting our jewelry from recycled genuine .925 sterling silver. I would recommend this necklace to anyone who is interested in having a familial piece. Truly lovely. I purchased several of these necklaces as Mother's Day gifts this year. I must say that they are much lovlier than they appear online. They have a bit of sparkle to them that you can't tell from the picture or even when they are in the box. But the sparkle is quite noticeable when worn. Everyone loved their gifts, and I was happy that they were happy. The price is more than reasonable for such a beautiful gift. So, don't let the picture online fool you. These necklaces are beautiful. This is a beautiful necklace. I have more expensive necklaces but this is my favorite. The pendant is very well made and very pretty and the chain has lots of sparkle. It is a short chain, but you need neckaces of every length depending on what you are wearing. I work in the medical field, so I wear scrubs all day. The length of the chain is perfect to wear with my uniform as it falls right in the V-neck. I If you are a man and considering buying this, go for it. Women love things with sentimental meaning and she will likely love this and the thought behind it, even if it is inexpensive. It does not look cheap though, I love it!I plan on getting one for my friend who is newley divorced, but one with one with just one parent.